Patents celebrate the human spirit of innovation, and new patents are a constant source of inspiration. But sometimes you come across some patents that seem a little... evil. Here are nine real-life patents that will make you despair about the human race. Yeah, we know, it's hard to keep up with all your different social media channels, you popular little snowflake. But you do, because nobody instagrams a sandwich or live-tweets a passive-aggressive couple's argument just quite the way you do — well, nobody, except this newly patented software from Google. First it watches you. Then it learns. Then, as far as your networks are concerned, it becomes you. It is basically the plot to The Talented Mr. Ripley — except that Matt Damon has been re-cast as an algorithm and, instead of rowing you out on a dinghy to the middle of a lake to murder you, he mostly just wants to be the first one on Facebook to wish you a happpppy birrrrthday!!!!1!1!! Still, this one is unsettling not just in the here and now, but in the long-range. Picture, long after we're all gone, after the concrete has been cracked through by the growing trees, after the coastlines have worn away into the ocean, after the shopping malls have been reclaimed by the crows and squirrels, only one sound remains: the ping of millions of little us-bots poking each other on Facebook. You know what's annoying? All the background noise on the other end of the line when you're trying to talk on the phone. Sure, you could just go find a quieter spot to talk in, or you could try this noise-dampening electronic throat tattoo patented by Google for Motorola. That's a normal, stylish thing to have on your neck, right? Kind of like a necklace — only implanted on your skin, and with the ability to steal voices. It does seem kind of one note, though… maybe if it had some other function. Fortunately, Motorola is way ahead of us. The tattoo can also use galvanic skin responses to tell when you are lying. Handy. For those of us with loved ones spread around the world, keeping in touch long-distance has never been easier. Video chatting, whether at your computer or just on your smartphone, is no further away than the touch of a button. Still, sometimes, Microsoft wants you to know, words just aren't enough. No, sometimes the only way to really say you care is with an animatronic hug sent directly from one tele-linked pillow to another. Of course, it's not just for hugs, Microsoft also suggests that you may want to make your business colleagues and acquaintances vaguely discomforted, with a long-distance handshake. Verizon patented this advertiser-friendly technology that combines a series of audio and visual sensors so that, while you watch TV, the TV can also watch you back and then send you tailored ads. So, just what behaviors will Verizon be looking for? According to the patent, it could be anything from "eating, exercising, laughing, reading, sleeping, talking, singing, humming, cleaning, and playing a musical instrument." And, in the interests of group togetherness, it's not just you they're worried about — but also, just how well you work and play with those nearest and dearest to you. The sensors will also be on the look out for "cuddling, fighting, participating in a game or sporting event, and talking." Some companies like to motivate employees with the promise of bonuses. Others use perks and vacation time. What they can't use, though, is a linked-web of sensory response monitors to measure the rise and fall of stress levels — because Microsoft has the patent on that one. According to the patent, a little ominously titled Monitoring Group Activities, the system would "automatically detect frustration or stress in the user via physiological and environmental sensors and then offer or provide some type of assistance accordingly." Just what sort of sensors? A whole lot, apparently: "Sensors can monitor the user's heart rate, blood pressure, body temperature, galvanic skin response, EMG, brain signals, respiration rate, movement, facial movements, facial expressions, etc." Of course, the patent does also leave room for another route, beyond these sensors: "Alternatively, Joe can expressly request assistance." So, that last patent was probably not great for morale. Nope, probably time to see about doing something to perk things back up around the old water cooler, like some extra vacation days, or a fancy new coffee machine, or perhaps just a giant database of all the ways in which you – yes, you personally — are annoying your co-workers. A patent filed by Microsoft in 2010 proposed a system to analyze digital communications — everything from video conferencing to emails to IM — between employees for behavior, gestures, ways of communicating, even clothing, that have been pre-flagged as bothersome. What would happen to the data next? It would be crunched to finally give a precise numerical value to the question of just how annoying your co-workers find you. 7) But, how did the ad make you feel? This gaze-tracking patent from Google is aimed at advertisers who want to know (exactly) just how many eyes see their ads, and for how long, using what they catchily call a "head mounted gaze tracking device". What makes this ad-revenue generating patent so out-of-the box special, though, is what it does next: it tracks the dilation of your pupils to measure your emotional response to those ads, and then stores it for future use. From the patent: "Inferring an emotional state of the user while viewing the external scenes based at least in part upon the pupil dilation information; and storing an emotional state indication associated with one or more of the identified items." Oh, sure, you can try to tell your friends that those commercials where one polar bear shares a Coke with another polar bear don't move you at all – but your Google head-mounted-gaze-tracking-device knows better. Your Google head-mounted-gaze-tracking-device knows all. 8) Your TV regrets to inform you that you have too many guests to watch this movie. Just what is the future of media? Is it a roll-over to entirely streaming video? The rise of the PC as TV? Or is it corporations monitoring the precise number of people watching a show, so that it can fine us for exceeding the licensing agreement for allowed number of views? If it's the last one, Microsoft has the patent. From the patent: "The limitation may comprise a number of user views, a number of user views over time, a number of simultaneous user views, views tied to user identities, views limited to user age or any variation or combination thereof, all tied to the number of actual content consumers allowed to view the content. Consumers are presented with a content selection and a choice of licenses allowing consumption of the content. In one embodiment, a license manager on the consuming device or on a content providers system manages license usage and content consumption. The users consuming the content on a display device are monitored so that if the number of user-views licensed is exceeded, remedial action may be taken." 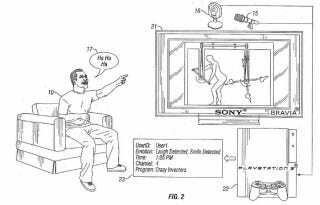 This laughter sensing tech was patented by Sony in 2011 for either use in its Playstation or to layer into a remote control. Not only does it know when you're laughing, but it also holds on to the data, to get a fuller picture of just where you fit in with your demographic counterparts. But in this case, it's the picture that really sells this one. Check out the artist's conception above that was included as part of the patent and then ask yourself, is this not the most terrifying of all possible futures?